This past Sunday we started talking about "The Joy of Giving." Last Saturday I witnessed "The Joy of Giving" firsthand here at JCPC. It happened as many gathered at the church at 8:00 a.m. to unload a tractor trailer full of pumpkins for our annual Pumpkin Patch. The money we make is used to help underwrite things like sending our children, youth, and even adults on mission trips and youth conferences. Now you may not think that 8:00 a.m. on a Saturday is a time for much joy, but actually it was! It was not only church members who showed up. We also had some volunteers who have not yet joined the church help out. In addition, we had the father of a young boy whose baseball team happened to be practicing on our ball field walk over and ask to help out. The joy was evident on the faces of everyone as they worked together to unload the pumpkins. I think this happened for at least two reasons: First of all, it is enjoyable to come together and do something worthwhile. Secondly, when you have more than two hours hanging out with other folks, it gives you time to get to know those you may not have met before on a Sunday. As people introduced themselves and found out each other's life stories, I saw smiles as new connections were made. Joy was all over the place! However, what gave me the greatest joy was a young man named Jordan. 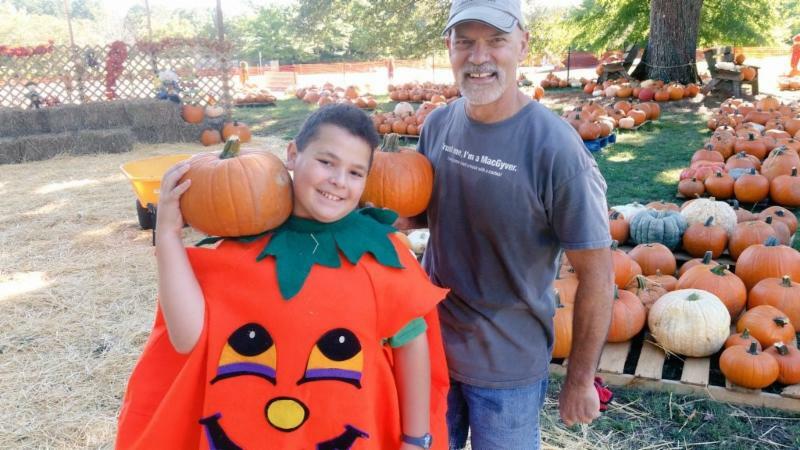 (Below is a picture of Jordan and Rick Zahnow in the Pumpkin Patch.) I was standing by my wheelbarrow when Jordan, a middle-schooler, rode up on his bicycle. He took off his helmet and told me he came to help unload pumpkins. I took him over to introduce him to Dawn Melin, who immediately recognized Jordan because she was his school principal last year. After we finished unloading, I asked Jordan why he came. He said that his family had always bought pumpkins from us, and that he had seen on our website that we needed volunteers to help - so he showed up on his bike to help. WOW! If that doesn't fill you heart with joy, I don't know what will. Gracious and giving God, thank you for the unexpected moments of joy that enter our lives. Help us to find ways to give to others today, so we might reflect the light of your joy into our world. We pray this in the strong name of Jesus the Christ. Amen.